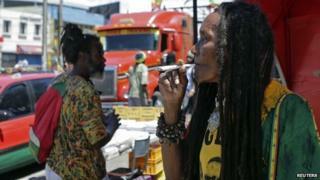 The Jamaican government has announced plans to radically reform the country's drug laws. The Justice Minister Mark Golding said the cabinet was supporting a proposal to allow possession of up to two ounces (57 grams) of marijuana, known locally as "ganja.". Mr Golding also said marijuana would be decriminalised for religious, medicinal and scientific purposes. It is expected parliament will approve the changes by September. "I wish to stress that the proposed changes to the law are not intended to promote or give a stamp of approval to the use of ganja for recreational purposes," said Mr Golding. "The objective is to provide a more enlightened approach to dealing with possession of small quantities." Correspondents say the government plans are a major victory for Jamaica's Rastafarian movement, which considers ganja sacred. Recent changes in drug laws in countries like Uruguay or in American states such as Colorado have also given impetus to campaigns by local farmers and some politicians for the legalisation of marijuana. "It is not only wrong but also foolhardy to continue with a law that makes it illegal to posses ganja and its derivatives for medicinal purposes," Mr Golding said. Angela Brown Burke, Kingston's mayor, said recently: "The time has come to provide an opportunity for Jamaicans to benefit from the marijuana industry." Correspondents say many Jamaicans believe the decriminalisation of the drug for medicinal and scientific purposes could bring important economic benefits to the island. Jamaica's economy has suffered from slow growth, high unemployment and high debt for the last two decades, according to the World Bank.